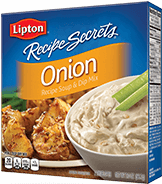 Onion Recipe Soup & Dip Mix is rated 4.9 out of 5 by 44. Rated 5 out of 5 by Anonymous from I have used the Lipton soup packets my whole life but never would have thought to use the recipe secrets. However I found this awesome recipe that uses the onion packet and it is so delicious. You use a slow cooker, and can use pork chops or chicken. You add one packet of the onion recipe secrets. Two cans of cream of mushroom. Fill the empty can of cream of mushroom with water twice and add it to the mix. Before you add the meat to the slow cooker mix the sauce. And season the meat with salt and pepper. I usually cook it on low for about 6 hours. And I make rice and veggies. It is a family favorite. Also, making an onion dip with the recipe secret is awesome too. 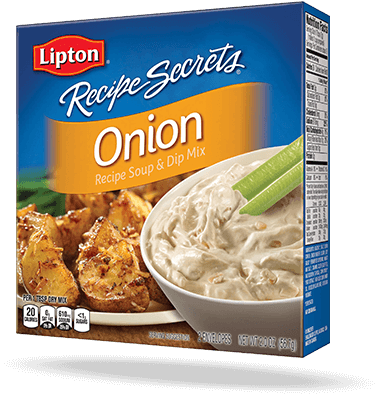 Rated 5 out of 5 by hmd1993 from I received the Lipton Recipe Secrets Onion Recipe Soup & Dip Mix complimentary in a vox box from Influenster. This mix changed my potato game! I often would make wedges (jojos) or a potato side dish both with some seasonings from my cupboard. When I received this rather then making a dip I decided to try the potato recipe suggested on the back. It was easy to make and tasted incredible! I had the left over by themselfs the next day and they were just as delicious reheated as they had been fresh. Since having had my potatos this way I cant look back! Ive since picked up a multi pack of the seasoning from Costco as I had seen it there on my last Costco run and it seemed reasonably priced from there. Rated 5 out of 5 by carmelina from I have never used this to actually make soup. There are many yummy recipes out there that call for this. I use it in a potato dish that is baked in the oven. I've never had my recipes turn out bad when I use this. It has a great onion taste that is not too strong. My Mom used this too. I definitely recommend trying! Rated 5 out of 5 by michelle_chloe from Let me start by saying I received this free via Influenster but have always used and kept on hand Lipton onion soup mix for so many recipes. I use it in a variety of things that I make. 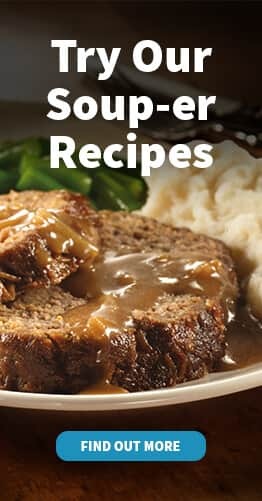 From throwing it into some ground beef for hamburgers, to putting it in the crockpot with a beef roast, it's so yummy. You can also go the original rout and just make good old onion soup. Sometimes I like to keep a pot of it in the refrigerator ready to go when I want a hot drink to curb my appetite. A cup only has 1 WW point and it has no Trans fat or sugars. Just make sure to watch out for all the sodium as it is quite high in sodium but a coffee cup full does the trick in keeping off the hunger attacks. Another amazing way to eat it is mixed in with some cream cheese and spread on a Bagel. If you cant find it in store just order on amazon and then you will back backups in the pantry. Im sure it will become a staple in your house as well once you try out some different recipes. Rated 5 out of 5 by jenniferl21 from This is a versatile product, but probably my favorite use for this product is to make onion dip. Just a 16 oz tub of sour cream, 1 packet of soup mix, mix it together and let it sit in the fridge for about 20-30 minutes. We NEVER have leftovers!